“The Watchman’s Handbook for the Last Seven Years on Earth!” from Christian Faith Publishing author Jack Binner is an analysis of the New Testament with special emphasis on the Book of Daniel, Revelations, and prophesies concerning the Second Coming of Christ. “The Watchman’s Handbook for the Last Seven Years on Earth!”: a study of the New Testament’s revelations about the end of days. 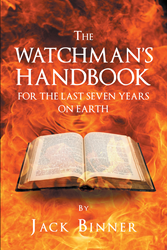 “The Watchman’s Handbook for the Last Seven Years on Earth!” is the creation of published author Jack Binner, an adult Sunday school teacher with a degree in Theology from Faith Baptist Bible College. Jack shares, “Over the years, I have spent considerable time studying the language and the manuscripts of the New Testament. I also have been blessed with multiple opportunities to teach adult Sunday school. The one subject that was constantly in demand was the Lord’s return. Adult believers have an insatiable appetite for an understanding of how this world age will end and any information about our Lord’s return. The Bible books that we mostly studied were the book written by Daniel the prophet and the Apostle John’s book called Revelation. One of my philosophies regarding the scriptures is that we must allow the scriptures to speak. We often come to the Bible with preconceived ideas and try to force the scriptures to say what we think they should say. This is unacceptable! ‘The Watchman’s Handbook’ was written after years of personal study and prayerful reflection for greater spiritual understanding. May the words of the handbook stir your heart and help you to gain a closer relationship with our loving God. When I was about five years old, my mother told me, “Someday, God is coming back. When He comes, He is going to take us up into the air to meet Him in the sky.” Wow! That was quite a declaration to a small child. When I was out of doors, I would look up into the sky and think to myself, when is God coming back for us? Published by Christian Faith Publishing, Jack Binner’s new book is a thought-provoking study of Scripture and its prophesies for the end of days. View a synopsis of “The Watchman’s Handbook for the Last Seven Years on Earth!” on YouTube. Readers can purchase “The Watchman’s Handbook for the Last Seven Years on Earth!” at traditional brick and mortar bookstores, or online at Amazon.com, Apple iTunes store, Kobo or Barnes and Noble. For additional information or inquiries about “The Watchman’s Handbook for the Last Seven Years on Earth!”, contact the Christian Faith Publishing media department at 866-554-0919.